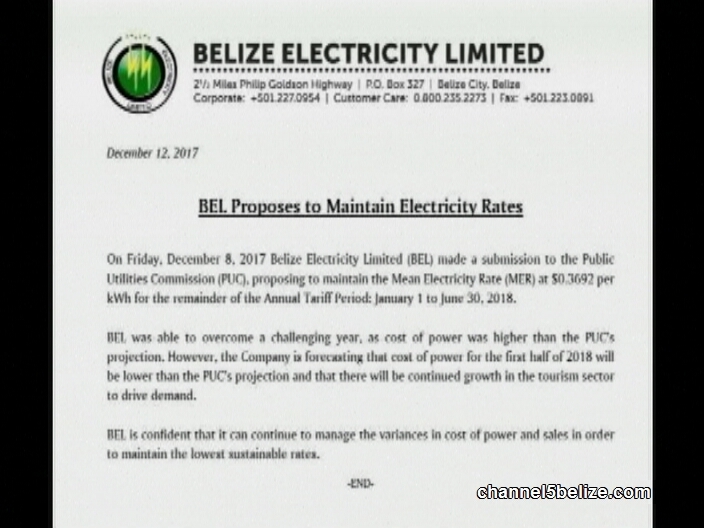 Belize Electricity Limited has managed to keep electricity rates steady for the past few years, and consumers can go into 2018 expecting no changes in the base cost of electricity. The company made its bi-annual submission to the Public Utilities Commission as part of the annual tariff review on Friday. It asked to keep the mean electricity rate at thirty-six point nine-two cents per kilowatt-hour for the remainder of the annual tariff period through June of 2018. The company says that its cost of power ran higher than the P.U.C. projection, but that this is expected to decrease during the first half of 2018. B.E.L. says it is also counting on tourism growth to keep rates steady. As part of the government’s raising funds for budgetary support, it passed a reduction of the threshold for payment of the General Sales Tax on electricity bills. 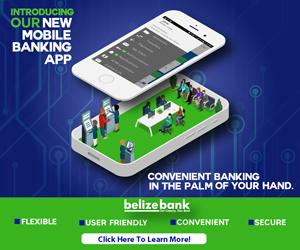 The threshold for the twelve-and-a-half percent tax was reduced from bills above two hundred dollars, to one hundred dollars, as according to Prime Minister Dean Barrow ‘poor people’s bills’ do not generally rise above that figure. 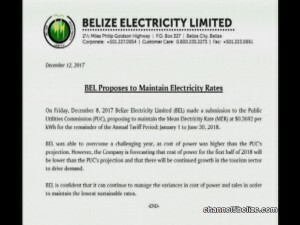 This is the price we have to pay for the so call “Nationalization” what a joke from this Government…overall no kind of benefits for Belizeans…but rather theft is what they did with all the legal cost involve and spending unnecessary tax payers money..